Samsung has shown off the Bendable TV – an 85in (216cm) prototype that allows the curvature of its screen to be adjusted by remote control. The LED (light-emitting diode) set was unveiled at the Consumer Electronics Show in Las Vegas. LG has also announced a smaller 77in (196cm) flexible TV of its own that is based on OLED (organic light-emitting diode) technology. The firms suggest that a curved screen can enhance the viewing experience. The tech would allow the sets’ owners to determine how bent the screens should be taking into account how many people were watching them and how far away they were sitting. The screens would have the added benefit of being able to be left flat against the wall when not in use. LG’s model will go on view when its show floor booth opens to attendees on Tuesday. However, industry watchers are unconvinced there is a market for such innovation. “The challenge for the firms is to demonstrate that the world really needs this,” said Martin Garner, a TV tech consultant from CCS Insight who is attending CES. 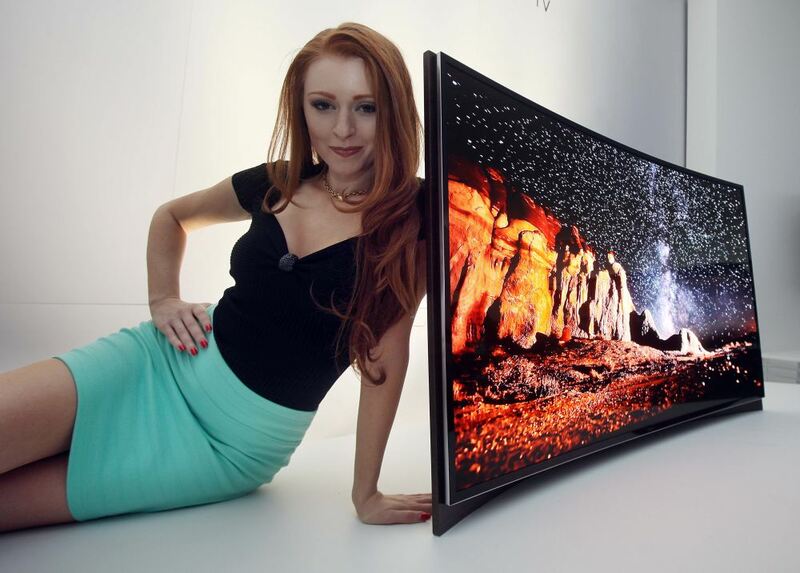 Neither of the two South Korean manufacturers have given a projected price or release date for the user-bendable TVs. They both, however, offer versions with a fixed curvature. The two companies are showing off new giant-sized 105in (267cm) concave-screened versions in the extra-wide 21:9 aspect ratio. Samsung said such a design delivered the “most immersive viewing experience” possible. However, a demonstration of the equipment went awry when it invited Michael Bay, director of the Transformers movies, on stage at its press conference. But when asked what he thought about the new set he found himself speechless, apologised and walked off stage leaving a stunned audience. Mr Bay later wrote a blog giving his take on the mishap. “Wow! I just embarrassed myself at CES,” he wrote. “I got so excited to talk, that I skipped over the Exec VP’s intro line and then the teleprompter got lost. This entry was posted in SCIENCE AND TECH and tagged LED, PROTOTYPE, SAMSUNG, TV.